Young Fredle by Cynthia Voigt. Review: Imagine being a tiny mouse living in fear of almost everything but food. What would you do if your family pushed you out of your nest and someone carried you outside to the wild? A young mouse named Fredle experiences this exact event after becoming sick from a mysterious and delicious food in the top of the pantry. This is the first event in a book titled Young Fredle, written by Cynthia Voigt. And it is a very exciting adventure book written in such a way that you could see it happening any time from 150 years ago to present day. 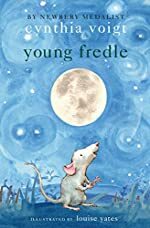 When Young Fredle the mouse is kicked out of his nest to 'went' after becoming sick, he is taken outside the kitchen and the house. This is the most important event in his life for it is his greatest (and only) adventure ever and it teaches him many important things that save his life. Fredle is a large kitchen mouse with a very troublesome sweet tooth. I like Fredle a lot because he is very good at learning just like me, even though his family and friends do not allow any change in their lives. He meets many people like field mice, cats, and a group of raccoons who try to eat him. He also meets a large snake and loads of cellar mice along his journey to return home, but the big question is will Fredle survive the journey? Cynthia Voigt used figurative language very well; she didn't overuse it so that it took away from the story and made it confusing, and she didn't use too little making the story boring. The book was written very well, it could have taken place nearly any time in history. This is a very good factor because if someone likes books from a certain time period, they can just think it is in that period. That will let them enjoy reading the book more than if the author told them that they disliked. The plot is also very good because throughout the story there are times of calm, of excitement and moments of breakthrough. Cynthia Voigt filled the genre very well by including all of the necessary elements of an adventure novel- excitement, setting change, and suspense. The hook however is not very exciting or interesting, but after the first or second chapter, it gets much more interesting. The author described things very well; I could easily tell where the characters were and what the location looked like. The book is very well paced; it is not too slow or too fast the entire time, and it varied in speed appropriately throughout the book. By the time you have gotten to the last chapter you have a pretty good idea of how the book will end. Overall, the book is great; though I am a bit too old for the book, I still liked it. From the point of view of my age (12), I would rate it an 8 out of 10. If I were 10, which is probably the best age to read the book, I would most likely give it 10 out of 10. Readers near the recommended age of 10 will like or even love Young Fredle. We would like to thank Random House for providing a copy of Young Fredle for this review. Have you read Young Fredle? How would you rate it?